Let us help you enhance the performance and achieve the old school hot rod look on your project with a Lake Header Kit. This is a great way for you to customize your project and get a set of headers that fit your specific build without the “universal” look with off of the shelf headers. We’ve got a variety of kits for you to choose from for your Buick, Cadillac, Chevrolet, Chrysler, Dodge, Ford, Mopar, Oldsmobile and Pontiac engines. We have the largest selection on the lake header kits available anywhere. Each of these kits include a pair of megaphones, 6 or 8 mandrel bends (6 cylinder or 8 cylinder, respectively) and a pair of exhaust flanges. The flanges are cut with a CNC HD (High Definition) Plasma cutter out of ⅜” Pickled and Oiled (P&O) steel. P&O material is hot rolled steel that has been dipped in acid to remove the mill scale and then lightly coated with oil. The end result is less work to clean off the mill scale as needed with hot rolled mild steel. The megaphones are custom rolled and welded to our specifications out of 18 gauge cold-rolled steel (thickest available on the market). The mandrel bends are also custom bent to our specifications to 70 degrees with one leg longer than the other to help make fabrication easier and fitment better. How does an Exhaust Header work? Headers are designed to make your engine perform better by helping it to “breathe” better. The goal is mainly to decrease exhaust flow resistance, or back pressure, and to increase the volumetric efficiency of an engine – resulting in a gain in power output. To make this happen, the cylinders each have their own exhaust tube leaving the cylinder heads. Those tubes are designed in a way that ensures their exhaust gas reaches the collector in intervals, avoiding the creation of back pressure. This allows your engine to run smoother and more efficiently with increased torque and power. Q: Can headers increase horsepower? A: Properly designed and tuned headers can result in a measurable power gain because the engine won’t have to work as hard to expel the exhaust gasses it produces. Properly tuned and matched headers (to the specific engine build and power range) help the engine breathe easier which results in “liberating” lost horsepower. However, lake headers are primarily built for aesthetic purposes and we claim no performance increases as these are sold in kit form (many factors are associated with properly designed headers for enhanced performance). Q: Do headers make your car faster? A: Headers need to be the correct length so exhaust pulses don’t interfere with each other and cause unnecessary back pressure. Headers should be matched with an appropriately sized set of exhaust primaries to achieve the best flow of exhaust away from the engine. However, headers alone won’t make your car much faster. The primary goal of the kits we sell is to provide a way for custom headers to be made as your project required. There are lots of combinations and factors that affect header fitment and a lot of the time, production headers are not made with the requirements needed, so we provide kits to help you build exactly what is needed. Q: Are exhaust headers street legal? 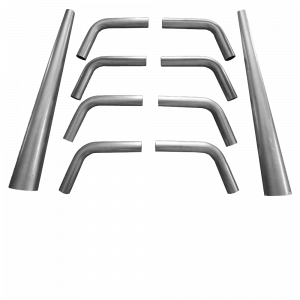 A: Most headers are 50-state street legal, which means that they don’t interfere with pollution controls or maximum noise requirements on your vehicle. 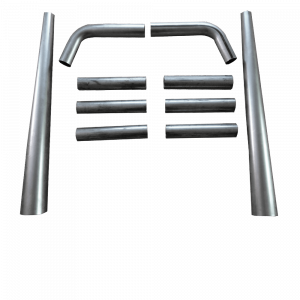 Headers that are not street legal are typically those that have specifically been developed for off-road and racing vehicles. These types of headers are normally exempt from smog certifications. Some states, such as Idaho, have more relaxed laws than others, such as California. In other words, what may be legal in Idaho may not be legal in California. If your state requires that you pass a smog test, get a set of headers that are 50-state street legal if you plan on driving your vehicle on public highways and roads. In order for you to know if your headers will be compliant with state and local laws, always check with your local DMV. More than likely, your car/truck project is exempt from these regulations due to its age and built prior to smog relations, but it is always good to verify first.